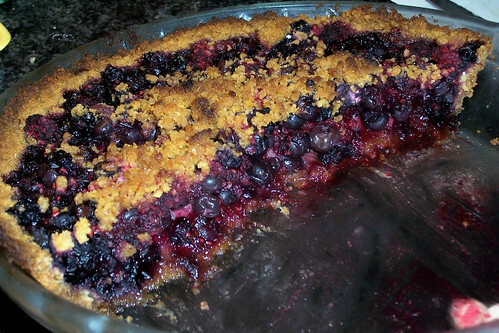 Rice came over and had some of my Blueberry Raspberry Pie with Graham Cracker Crumb Crust. She has been badgering me for the recipe ever since. It’s seriously easy, unlike every other pie recipe I make. Yum. This is even after it was in the fridge a few days. If you’re making everything right away, preheat the oven to 425 degrees. Smush or blend crackers to even fine crumbs. Pour crumbs into mixing bowl; add cinnamon, sugar, and butter. Blend well with fingers or a fork. Reserve a few tablespoons for the topping. Pour into a 9-inch pie plate, pressing firmly to sides of pie plate. Cool until ready to fill. When the pie is filled, scatter the reserved crumbs over the top. I always make a bit more than it calls for so I have a little extra for the top. This crust is so tasty.